The Spooky Vegan: Happy Mother's Day! Wishing all the mom's out there an extra special Mother's Day! I'd like to thank my own amazing mom for always having my back, always being encouraging and loving, taking the time to listen, putting family first, encouraging me to be myself and teaching me that whatever boys did girls could do better! 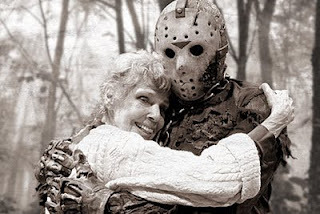 And I know that if needed, Mom, you would totally avenge my death by hacking apart camp counselors on Friday the 13th! Mom, you are a true inspiration and I love you!